January 3, 2019 marked the 10-year anniversary of the original blockchain. Created using technology described by the still anonymous Satoshi Nakamoto in a whitepaper published in 2008, the first blockchain, called Bitcoin, is still the best-known digital currency. Since Bitcoin’s launch, an estimated 3,000 new crypto currencies have been created. More than 2,000 are being actively traded and another 900 listed as dead, scam, parody or hacks. Blockchain technology is not hardware, but instead software that runs on a com- puter or smart phone called a node. The node has two functions, connecting with other nodes in the network and keeping its copy of the blockchain transaction ledger updated. With a single version of the exact same digital ledger stored on every node on the network, new data can be added to the system in an efficient, distributed and secure manner. It’s difficult to quantify how many of the currencies were created in the past decade to support social good projects or even how many social good organizations are participating in the blockchain ecosystem. The burgeoning social good space includes international nonprofit institutions, both domestic and global social impact investing, individual donors and government programs in addition to tax-exempt U.S.-based organizations. "FinTech4Good is ripe for inspiring and innovative blockchain projects. ...like Pigzbe Researchers at Stanford University studied a sample of projects and found nonprofit metrics matched those of corporations in two ways. First, almost 80 percent of the blockchain for good initiatives focus on creating efficiencies and effectiveness in existing financial and asset tracking systems, not on innovation. Second, similar environment, U.S.-based nonprofits are primarily investing in crypto-based fintech (financial technology) applications. FinTech applications use emerging technology to enhance the delivery of financial services such as banking and money transfer. FinTech applications were initially targeted toward the back-office operations of banks, mortgage companies and other large financial institutions. FinTech applications designed for the consumer market are disrupting the financial services industry and enhanced FinTech ’s jurisdiction to include key business units like strategic planning, finance, and fundraising. With the emergent “4Good” space encompassing traditional nonprofits, social impact groups, government and individuals, and FinTech’s growing landscape, the realm of FinTech4Good is ripe for both inspiring and innovative blockchain projects. Innovative FinTech4Good projects fundamentally shift thinking and how people operate in their environment. 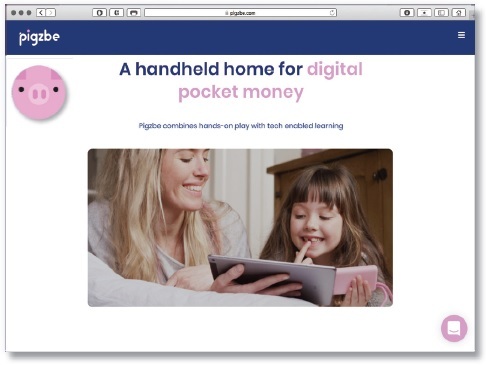 The financial literacy project Pigzbe in Switzerland is emerging as a FinTech4Good blockchain innovation. The design goal of Pigzbe is to make digital money visible and transferable for kids. The Pigzbe device is the size of a deck of cards and becomes a child’s digital piggybank storing both fiat and crypto currency. The device allows parents to deposit allowances and to create tasks for completion before a reward can be earned. Bchildren are allowed to spend their accumulated funds at parent-approved sites. 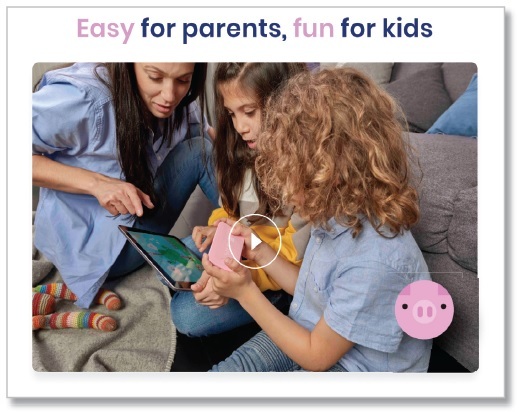 Pigzbe is designed for children ages 6 and up to teach financial literacy in a digital world. As a blockchain-enabled education tool, the designers are pioneering the integration of blockchain technology with a physical device, the Pigzbe kid-proof hardware wallet. 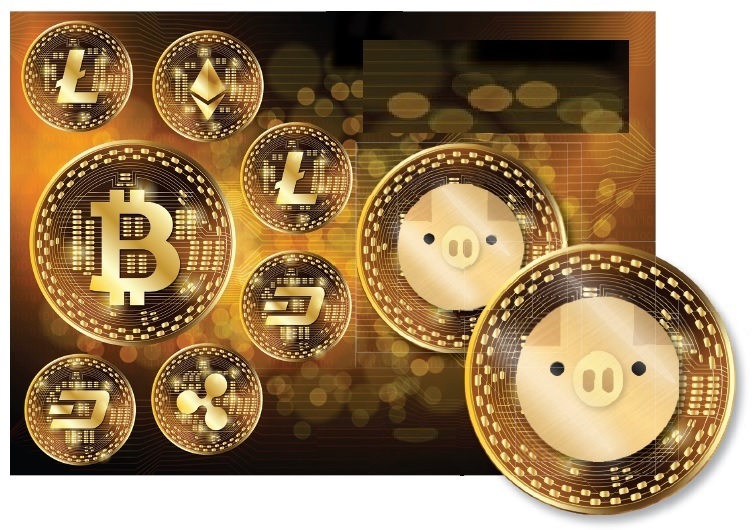 Physical pink piggybanks with tiny gold locks have little connection to today’s financial world and have ceased being an effective teaching tool for parents who want their children to learn about saving, spending and securing digital funds. As we move further toward a cashless society, children will have even less access to hard currency and fewer opportunities to learn how to exchange it for goods and services. The metrics of trade are difficult to understand and the process to secure the asset are confusing, especially without seeing actual coins and cash. Parents and educators need new tools to create the understanding for digital money, digital payments and data security. Using blockchain technology to teach financial literacy to children is new. The device can be customized by country, adapted for new demographics or modified for specific learning needs. Pigzbe has a strong Kickstarter campaign with $98,898 in pledges, almost twice its original goal, but like many blockchain projects, Pigzbe is in startup mode and does not have a product built. The micro transactions and secure environment required by Pigzbe can only be realized using blockchain technology. Pigzbe creates a new environment for learning and is an inspiring and innovative application of blockchain-enabled FinTech4Good. Most FinTech4Good blockchain applications are not innovative. However, they are inspiring when they provide the means to get the same work is done in a more effective way. From facilitating global remittances, to enabling micro-donations, to improving transparency and to reducing counterfeit goods, these new blockchain projects “easily” create digital audit trails that are secure and yet available to all stakeholders. The current process of manually tracking every asset as it moves through the social good system, whether it is refugees, fish, lumbers or blood diamonds can be replaced with secure distributed ledgers that are generated and shared by all stakeholders. Increasing financial literacy and inclusion are the social good aspirations of many associations and membership groups. In the blockchain ecosystem two global membership groups focus on increasing the adoption of blockchain technology and crypto currency through education. The Blockchain Industry Group (BIG) and the Metcalfe Society are digital communities that take distinct approaches to membership growth. BIG started with a social media following of 3.8 million and is taking a more traditional strategy to creating their community by offering discounted subscriptions to its social media followers. In addition to BIG’s international FinTech4Good financial literacy programming, a portion of the BIG membership fee goes to selected nonprofits. The Metcalfe Society started out with zero members in 2018 but has plans to grow membership by personal philanthropy using blockchain technology and networking strategy. Metcalfe’s Law states that the value of the network grows by the square of the number of users. The Metcalfe Society’s strategy to increase adoption of crypto currency is to get 20 percent of the crypto holders in the world to donate $10 to two people who do not own any digital currency. If the estimated 22 million crypto holders follow through on their pledge, 8 million new crypto users will be added to the network in a single day. The Metcalfe Society is a blockchain startup with inspiring social good goals for financial literacy and inclusion. The Pineapple Fund, set up by an anonymous crypto philanthropist, distributed a fresh $55 million into the social good economy in 2018, the same year Brian Armstrong, CEO of Coinbase, one of the biggest crypto companies became the first crypto entrepreneur to join the Giving Pledge. Some holders of crypto clearly want to engage in philanthropy. Expected changes in philanthropy driven by Millennials and the possible elimination of individual tax incentives for charitable donations means that social good organizations need creative, innovative and inspiring FinTech4Good solutions. FinTech4Good projects must remain relevant as innovative companies across every sector begin to solve market inefficiencies and create new solutions using blockchain technology. The blockchain ecosystem is opening new doors for nonprofits by enabling faster and lower cost money transfers, access to new donor pools and development of innovative social good projects like Pigzbe. Blockchain technology and crypto currencies provide opportunities for advancement in the FinTech4Good ecosystem, both incremental and groundbreaking.